Petrus Guranerius was born in Cremona in 1695 as the son of Joseph. He worked with his uncle Petrus in Mantua from 1725-1739. Thereafter he worked until 1762 in Venice. He is especially well-known for his beautiful cellos. Our version of the "Petrus Guarneri" is an absolute favorite. Its beautiful sound and resonance amazes cellists and has also gained for them many prizes. Our model of a Petrus Guarneri from 1739 comes very close to the ideal cello. It has a profound, voluminous bass as well as a transparent and assertive pitch with a perfect balance that gives the musician unlimited possibilities for interpretation. 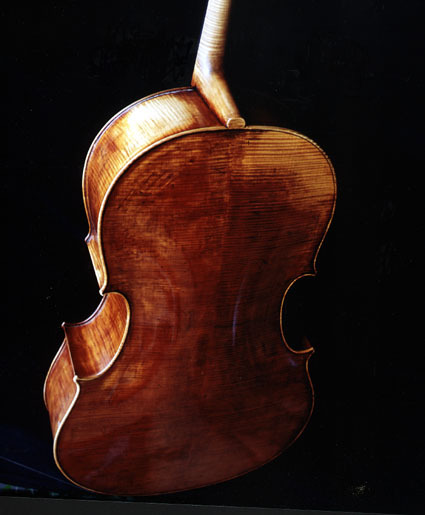 You can listen to this cello at our audio samples link. The cello tango CD can be purchased here it is a must for every cello enthusiast! From the latest CD of the Celloproject Russian Soul, on which the cello can be heard. John Myerscough plays a cello by Haat-Hedlef Uilderks after Petrus Guarnerius.